Most leadership research focuses on the internal qualities and traits of the person in charge. In contrast, when we focus on the relationship between the leader and their followers, what’s needed changes according to the current context and people involved. And, the prized qualities of what makes an effective leader also changes: To have a following you need to be authentic and real. This is episode #51 of the Ideas Architect podcast. And, it’s a Book Rapper recording derived from an important business book. 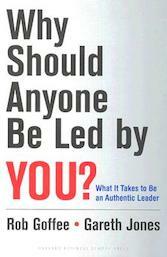 Today we are covering a highly regarded leadership book called Why Should Anyone Be Led By You? – What it takes to be an authentic leader. It’s by researchers and consultants Rob Goffee and Gareth Jones and it’s published by Harvard Business School Press. This book is part of our Book Rapper Leadership Series where we have rapped nine of the best leadership books of all time in one collection so you can digest them all in about the time it takes to read a single book. Three Leadership Axioms – The three golden rules needed when we change leadership from the traits of a person to authenticity.